Hello everyone, welcome and thanks for stopping by today. I hope you are having a great week. I've had issues all this week with nasty little headaches that just won't seem to go away. I have "weather induced" headaches....I know...crazy...right? My head seems to think it's a barometer and when the atmospheric pressure is out of whack (like it is most of the summer in southeast Alabama), I have to deal with these headaches. I am thankful that it hasn't been a bad one this time...just one of those that gets right behind your eye and doesn't want to go away. Anyway...that's what "Excedrin Migraine" is for! 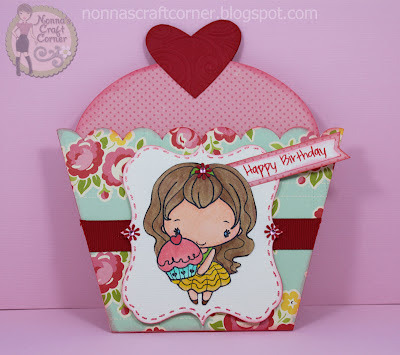 * Papers - More gorgeous "October Afternoon"
* Sentiment - "Pink By Design"
I mean seriously...how cute is that? And there you go....total sweetness! Ok, I'm off to see what I can work on while this headache is not too bad. It's almost Friday so I hope you all have a wonderful weekend! I'll be seeing you soon. * I am linking this card to the DL. 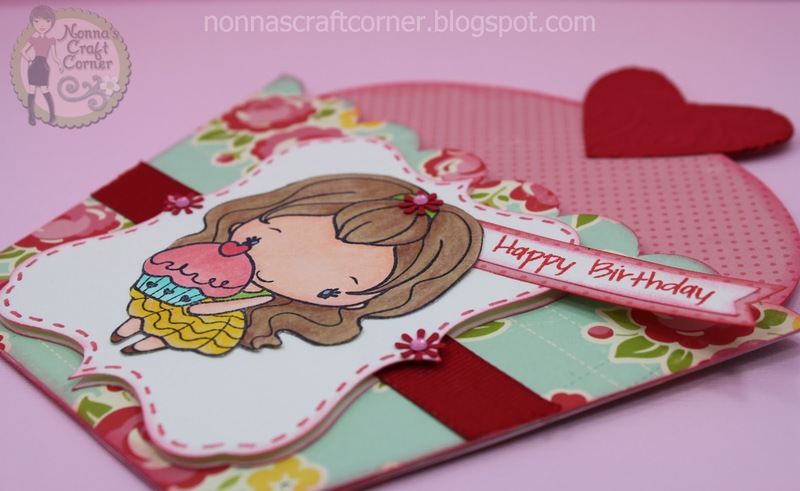 ART Happy Birthday Linky Party and Give-away! Your card is really sweet! Hope your head feels better soon. OMG...this card is just so ADORABLE! I love the shape and colors! Super cute! I love the greeting farm stamps :) great job with the copics!! Wow, this is so cute!! Really love that card shape and that sweet little image is just adorable!! Grea job on the coloring too, I really need to learn how to use Copics!! What a fun card!! 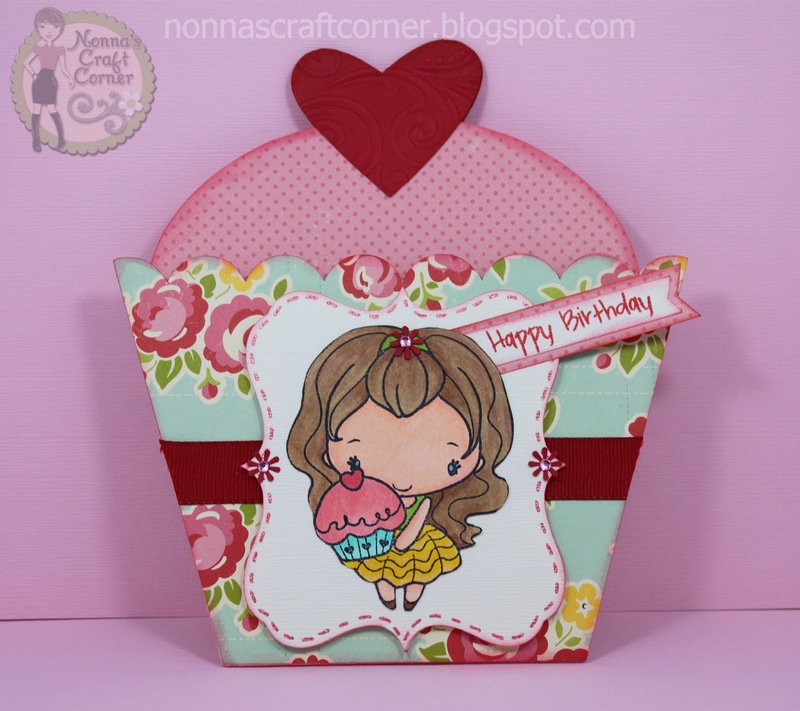 Love the colors, the image and the shape of your card!!! You're right. This is adorable. Hope your headache is better soon. I know all about those darn headaches! Hope you feel better soon. This is precious Tanya. I know what you mean with the headaches. Lately, it's been a battle between the headaches and "Arthur"! I really don't like Arthur at all. On a more positive note, I can certainly predict the weather a lot better than the news. Hee! Hee! Oh well... Everyday is a wonderful day... it's just some are better than others, right? 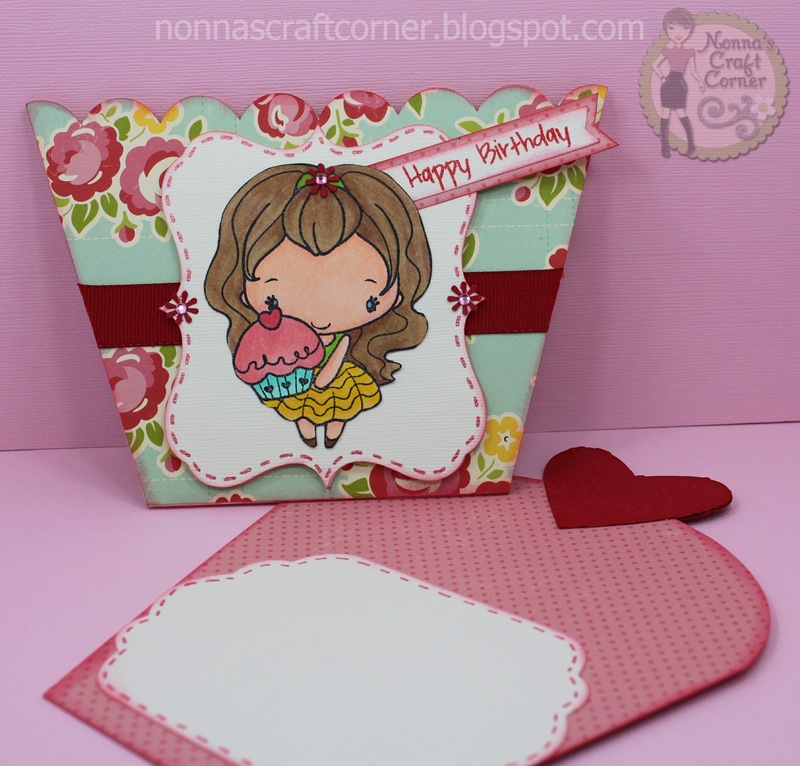 Your card is amazing and I am so looking forward to your first project with your new goodies! Very sweet card! Love how you colored the girl! Oh, too cute! Love how the cupcake pulls out! You should enter this at Little Scrap Pieces. Thanks for your comments on my birthday card.--Pat N.
I hope your headache feels better soon! Super cute Tanya! This is such a fun card! Hope you are feeling better real soon. I hate those headaches that come out a know where. Take care and have a great day! This is darling! And I love the fabulous way the top fits into the liner. That is just TOO clever! I rarely get headaches and my heart just goes out to you having so many! I'm so glad you've got a medication that works for you. Visiting from DLART Linky party. Like shape cards. Especially like the pocket card style.